This Twitter language guide can help anyone new to the Twittersphere by explaining Twitter slang and tweeting lingo in plain English. Use it as a Twitter dictionary to look up any Twitter words or acronyms you don't understand. @ Sign-- The @ sign is an important code on Twitter, used to refer to individuals on Twitter. It is combined with a username and inserted into tweets to refer to that person or send them a public message. (Example: @username.) When @ precedes a username, it automatically gets linked to that user's profile page. Blocking -- Blocking on Twitter means preventing someone from following you or subscribing to your tweets. Direct Message, DM -- A direct message is a private message sent on Twitter to someone who is following you. These cannot be sent to anyone who is not following you. On Twitter's website, click the "message" menu and then "new message" to send a direct message. More about DM. Favorite -- Favorite is a feature on Twitter that allows you to mark a tweet as a favorite to easily see it later. Click the "Favorite" link (next to a star icon) beneath any tweet to favorite it. #FF or Follow Friday -- #FF refers to "Follow Friday," a tradition that involves Twitter users recommending people to follow on Fridays. These tweets contain the hashtag #FF or #FollowFriday. The Guide to Follow Friday explains how to participate in #FF on Twitter. Find People/Who to Follow -- "Find people" is a function on Twitter now marked "Who to Follow" that helps users find friends and other people to follow. Click "Who to Follow" at the top of your Twitter homepage to start finding people. This article explains how to find celebrities on Twitter. Follow, Follower -- Following someone on Twitter means subscribing to their tweets or messages. A follower is someone who follows or subscribes to another person's tweets. Learn more in this guide to Twitter followers. Handle, Username -- A Twitter handle is a username selected by anyone using Twitter and must contain fewer than 15 characters. Each Twitter handle has a unique URL, with the handle added after twitter.com. Example: http://twitter.com/username. Hashtag -- A Twitter hashtag refers to a topic, keyword or phrase preceded by the # symbol. An example is #skydivinglessons. Hashtags are used to categorize messages on Twitter. 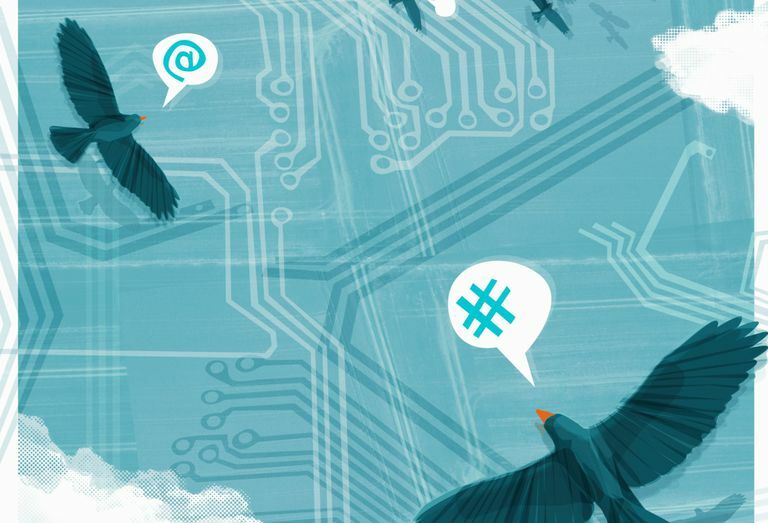 Read a definition of hashtags or more about using hashtags on Twitter. Lists -- Twitter lists are collections of Twitter accounts or usernames which anyone can create. People can follow a Twitter list with one click and see a stream of all the tweets sent by everyone in that list. This tutorial explains how to use Twitter lists. Mention -- A mention refers to a tweet that includes a reference to any Twitter user by placing the @symbol in front of their handle or username. (Example: @username.) Twitter tracks mentions of users when the @symbol is included in the message. Modified Tweet or MT or MRT. This is basically a retweet that has been modified from the original. Sometimes when retweeting, people have to shorten the original tweet to make it fit while adding their own comments, so they truncate the original and add MT or MRT to signify the change. Mute: The Twitter mute button does something different but somewhat similar to a block. It lets users block tweets from specific users-- while still being able to view any incoming messages from them or @mentions. More about mute. Profile -- A Twitter profile is the page that displays information about a particular user. Promoted Tweets -- Promoted tweets are Twitter messages that companies or businesses have paid to promote so they appear at the top of Twitter's search results. More on Twitter advertising. Reply, @Reply -- A reply on Twitter is a direct tweet sent by clicking on the "reply" button that appears on another tweet, thus linking the two tweets. Reply tweets always start with "@username." Retweet -- A retweet (noun) means a tweet that had been forwarded or "resent" on Twitter by someone, but was originally written and sent by someone else. To retweet (verb) means to send someone else's tweet to your followers. Retweeting is a common activity on Twitter and reflects the popularity of individual tweets. How to Retweet. RT -- RT is an abbreviation for "retweet" that is used as a code and inserted into a message being resent to tell others that it's a retweet. More about the retweet definition. Short Code -- On Twitter, the short code refers to a 5-digit phone number that people use to send and receive tweets by SMS text messages on mobile phones. In the United States, for example, the code is 40404. Subtweet / subtweeting -- A subtweet refers to a tweet written about a particular person, but containing no direct mention of that person. It's usually cryptic to others, but intelligible to the person it's about and people who know them well. TBT or Throwback Thursday -- TBT is a popular hashtag on Twitter (it stands for Throwback Thursday) and other social networks that people use to reminisce about the past by sharing photos and other information from years gone by. Timeline -- A Twitter timeline is a list of tweets that is dynamically updated, with the most recent appearing at the top. Each user has a timeline of tweets from the people they follow, which appears on their Twitter homepage. The tweet list appearing there is called a "home timeline." Learn more in this Twitter timelines explainer or this tutorial on Twitter timeline tools. Top Tweets -- Top tweets are those Twitter deems to be most popular at any moment based on a secret algorithm. Twitter describes them as messages "that lots of people are interacting with and sharing via retweets, replies, and more." Top tweets are displayed under the Twitter handle @toptweets. Tos -- The Twitter TOS or Terms of Service is a legal document each user must accept when they create an account on Twitter. It outlines the rights and responsibilities for users on the social messaging service. Trending Topic -- Trending topics on Twitter are topics people are tweeting about that are deemed most popular at any given moment. They appear on the right side of your Twitter homepage. In addition to the official "trending topics" list, many third-party tools are available for tracking the most popular keywords and hashtags on Twitter. Tweep -- Tweep at its most literal sense means a follower on Twitter. It's also used to refer to groups of people who follow one another. And sometimes tweep can refer to a beginner on Twitter. Tweet -- Tweet (noun) is a message posted on Twitter with 280 or fewer characters, also called a post or an update. Tweet (verb) means to send a tweet (AKA post, update, message) via Twitter. Tweet Button -- Tweet buttons are buttons you can add to any website, which allow others to click the button and automatically post a tweet containing a link to that site. Twitterati -- Twitterati is slang for popular users on Twitter, people who usually have large groups of followers and are well known. Twitterer -- A Twitterer is a person who uses Twitter. Twitosphere -- The Twitosphere (sometimes spelled "Twittosphere" or even "Twittersphere") is all the people who tweet. Twitterverse -- Twitterverse is a mashup of Twitter and universe. It refers to the entire universe of Twitter, including all its users, tweets and cultural conventions. Un-follow or Unfollow -- To un-follow on Twitter means to stop subscribing or following another person's tweets. You un-follow people by clicking on "following" on your homepage to see your list of followers. Then mouse over "Following" to the right of any user's name and click the red "Unfollow" button. Username, Handle -- A Twitter username is the same thing as a Twitter handle. It's the name each person selects to use Twitter and must contain fewer than 15 characters. Each Twitter username has a unique URL, with the username added after twitter.com. Example: http://twitter.com/username. Verified Account -- Verified is the phrase Twitter uses for accounts for which it has certified the owner's identity-- that the user is who they claim to be. Verified accounts are marked with a blue checkmark badge on their profile page. Many belong to celebrities, politicians, media personalities and well-known businesses. WCW -- #WCE is a popular hashtag on Twitter and other social networks that stands for "women crush Wednesday" and refers to a meme in which people post photos of women they like or admire.